Welcome to Villa Tiki ! First Ecolabeled Surflodge in Europe! 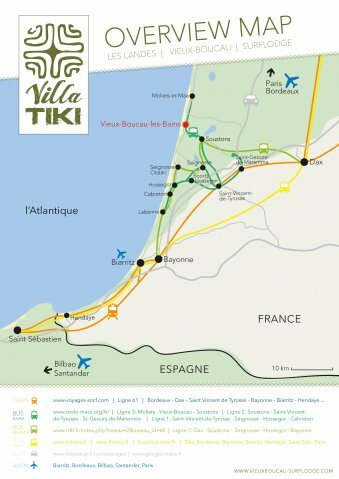 Villa Tiki is located in Vieux-Boucau, Landes, 15km from Hossegor. The Villa has 3 bedrooms: a double room, a dormitory with 6 beds and a room for 4 to 5 people. A hut in the garden is designed to accommodate two or three people. You will enjoy a tree-shaded garden, hammocks, barbecue and prepare your own meal in the full equiped collective kitchen. A wide range of surfboards and wetsuits are available for hire on site. You can also rent bikes. We offer yoga course for every level. Restaurants and shops nearby are accessible by walk or bike, you don't need a car during your stay! Construction of Vieux-Boucau Surflodge and daily operations are made in a sustainable way. 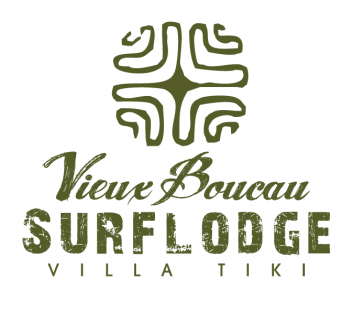 Villa Tiki is the first Surflodge in Europe to have obtained the European Ecolabel, an exelence label recognized for its high standards.